Although optional, it is recommended that this session be executed. Make sure all periods (fiscal and reporting) are finally closed EXCEPT the GLD module in the last period (typically the correction period). The GLD module needs to REMAIN open in the last period for fiscal, reporting, and tax. Although optional, it is recommended that your system administrator create a backup tape prior to starting the Year-end processing. This session clears out the P&L accounts and creates a batch in the General Ledger which needs to be finalized. The transaction type specified must have a category of “journal voucher”, and the date specified should be the last day of the year. Automatic Balancing of the Profit and Loss accounts reverse the balances in the “Profit and Loss” accounts and the offset to this entry is to the account defined in the “Maintain Company Parameters” session in the field “Interim Closing Account”. There are two options available which define how this entry reverses. The choices are defined below. Individual Account – Each account balance is reversed. Subtotal – The net of the profit and loss accounts is combined and the entry is made to the account defined in the company parameters “Balancing Account P& L”. The following should be considered before selecting one of the above options. When the autobalancing session is executed, the user defines both the date and the period the entry should update. If a correction period is not used (setup in Maintain Periods), the last period is then period twelve. If the choice is individual accounts, all the P & L balances will be reversed in period twelve. The ability to run your Financial Statements and Trial Balance in period twelve for your P&L accounts is no longer possible because the balances are zero. If the individual accounts is the option selected, the user should have defined a correction period for fiscal and reporting periods (if used), and the autobalance entry should be made to this period. The subtotal option leaves the balances in the individual accounts. The P&L accounts will start with a zero balance in the new year. Bottom line if no correction period is identified do not use individual accounts option. For the Fiscal, Reporting, and Tax (if applicable) periods, finally close them. This optional session can be executed to simulate the closing of the year so that the data of that year can be used for preparing the provisional opening balances for the new fiscal year. The session requires input of the current fiscal year, next fiscal year, and an interim closing account. The amounts of all ledger accounts that are defined as profit and loss accounts are accumulated and inserted into the interim closing account. – all existing batches within the fiscal year to be closed must have been finalized. – all periods must have been finally closed. – at the end of the selected fiscal year, the debit and credit balances must match. – the session Automatic Balancing of Profit and Loss Accounts (tfgld6202m000)must have been executed. – there may be no current account entries for the selected company whose fiscal year is about to be closed. – the transaction type specified must have a category of “opening balance”, the transaction type specified must have a fixed series associated with it, and the date specified must be the first day of the new year. This session will roll all balances over to the new year. It will also update the fiscal year in the parameters. Make sure all periods (fiscal and reporting) are finally closed EXCEPT the GLD module in the last period (typically the correction period). The GLD module needs to REMAIN open in the last period in the last period for fiscal, reporting, and tax..
For Fiscal, Reporting, and Tax (if applicable) periods, close (soft close, not finally close) them. At this point, when financial statements for the new year are run, they will reflect the opening balances based on the provisional close. When you are ready to make your audit adjustments continue with the steps listed below. Re-open the last period (fiscal, reporting, and tax) for the GLD module. 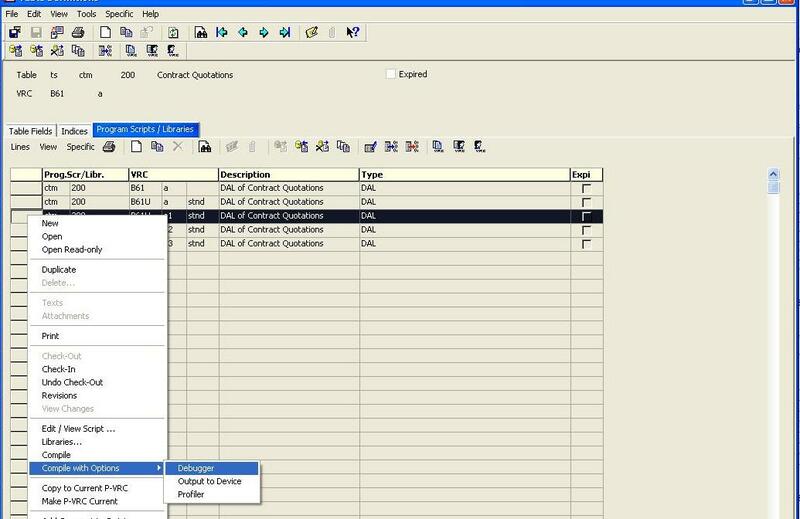 Enter your journal entries and finalize the batch(es). Year-end procedure culminates into closing the books finally, generation of final Trial Balance and posting opening balances to New Year. This is technically termed as ‘Final Closure’ or ‘Hard Closure’. This is possible only after the books are actually finalized, and audited balance sheet is signed. But till then one can’t keep the New Year books without opening balance. This calls for a ‘Soft Closure’ or ‘Provisional Closure’. Provisional closure does not mean that the books are closed forever. Still we can enter transactions in the previous year, but in a new period called ‘Correction Period’. In fact there can be a number of soft closures before the final closure, depending upon the circumstances. Before Soft Closure, each period should have been closed. This calls for what is known as “Periodic Processing” which will be done at the end of each period (say, every month). Post all Integration & Fixed assets transactions. Rebuild History from Transactions, using session “tfgld3203m000 – Rebuild Opening Balance/History from Transactions”. [Path: General Ledger/Utility]. [While running this session, ensure that nobody is using Finance Module]. Perform Periodic Processing procedure for all periods, till the latest correction period, if any, used. Don’t close the tax period. See that the current & Next Fiscal year are correctly displayed in the session. The Current Fiscal year is what is maintained in the session “tfgld0503m000 – Maintain Company Parameters”. This field is available for manual input only at the time of initialization. Thereafter, the system will automatically update this field at the beginning of every year (as soon as the Year is closed, using the session “tfgld6203m000 – Close Year” – See Below). See that the interim Closing account is correctly displayed in the session. This account is a Balance Sheet A/c, and is used to balance all P&L entries during the provisional/final closure. This is nothing but the “Profit for the year” listed under the liabilities side of the balance sheet. This is maintained in form 5 of session “tfgld0503m000 – Maintain Company Parameters”. With this exercise, the system will not actually pass an entry. It just calculates profit/loss figure, and update the opening balances of next year, with this profit/loss & other balances in the balance sheet (Actual entries get passed only at the time of Year Closure, i.e., Hard Closure). The system generates a statement of Provisional Closing Balance (an opening Trial Balance for the next year). Take T/B for current year, and compare closing balances for the correctness of the former, to check if the same closing balances have gone as Opening balances for the next year. Close the year Provisionally and check the balances. Finally close all the periods (except the last period, i.e., Closing period) of all period types (Except Tax Period) for all modules. Close the P&L A/c, using session tfgld6202m000 – Automatic Balancing of P&L A/c. Ensure that the default series for the closing transaction type pertains to the last (closing) period. If not, go and set the same in session Maintain transaction type. Give the transaction entry date and doc. Date as the last date of the closing year, and Fiscal & reporting periods as the last (closing) periods and press “Continue”. The above accounts are maintained in the same session. The first a/c is of P&L type and the second one is of B/S type. The process may not be thru. For many reasons. Here are some of the trouble-shooting tips. Non-finalized batches might exist. Find out, finalize the transactions and try again. The above is very unlikely, because in such case, the period itself won’t close. May be, some batches have taken the status “Free”. Check if any transactions exist in those batches, and see if they are actually finalized. If there is any discrepancies/inconsistencies in the status, manually correct the status in tfgld100. But this is the last option. There might be error logs for the transactions. Clear the logs, and try again. There might be un-balanced transactions. Find out the same using session “tfgld3410m000 – Print Debit/Credit amounts by documents” with the flag “differences only” set to “yes”. This difference may be because of rounding off error (correct in tfgld106), or only one aspect of transaction got posted from the sub modules (which is very unlikely). In this case, the whole transaction would have got ignored in GL, and only one aspect has come in sub module. The GL & Sub ledger will not tally. Find out, delete the whole transaction from tfgld106 and all related tables, then enter the transaction afresh and finalize. You may also run TB for highest-level accounts to find if the Sources & Applications of fund tally. There may be round off difference. Locate the exact document using the above session. If it is a rounding off difference, it has to be corrected through GTM. If it is some other difference, some appropriate action has to be taken to resolve the issue. You might have made a manual single sided correction in trgld106 or tfgld203. Find out and rectify. Don’t close it finally because, this step also may not be through, due to some of the problems mentioned above. Take appropriate actions as above, depending upon the circumstances. Once the above process is successful, close the same Finally. Now run session “tfgld6203m000 – Close Year”. If all the above issues are resolved effectively, this process will be through. Before running this session, ensure that a transaction type for passing opening entry for next year is defined in session “tfgld1101m000 – Maintain Transaction Types”. The Trans. Type must of the category “Opening Balance” and must have a series of the first period of next year. In session “tfgld6203m000 – Close Year”, attach the above transaction type; give the date as the 1st day of next year; and fiscal & reporting periods, first periods of next year. Any of the above mentioned problem may pop up here, as far as the accounts are concerned are balance sheet items. This happens when the user has skipped some dimensions while entering the transactions. But when dimension field is mandatory, the system does not allow skipping. But it may so happen that initially the dimension was optional/not used, and subsequently made mandatory. System does not allow this also. But this change could be done through GTM correction. In such cases, ultimately it gives raise to above message. Find out all such transactions, manually key in the respective dimension through GTM, rebuild history from transactions, and try closing the year. While entering the opening balances, during the implementation time, dimensions were optional/mandatory for some of the ledgers. Subsequently it is made mandatory as above, but corresponding open dimension balance is not found. Correct this by manually keying-in the dimensions in tfgld204, rebuild history from transactions. Once this session is through, the system will remove the opening balances it had put during provisional closure, and pass an opening entry in the next year, using the transaction type defined above. The field current fiscal year in session “tfgld0503m000 – Maintain Company Parameters” will get changed to the next year. Now for all purposes the current fiscal year will be the new-year. Now if you again click on the session “tfgld6203m000 – Close Year”, it won’t allow you to do that. You will get a message “End dates for the next fiscal year not defined”. Check the new document of opening entries in the new current year, and finalize. Proceed with the year beginning procedure. But this procedure need not necessarily start after the year-end procedures. This can be carried out even independently, as the books should be open for the current year even before we can close the previous year. DAL, Data Access Layer is a new concept introduced in higher versions of Baan, from Baan V onwards. The very reason of introducing the same, was to have a common platform to write all the common Business Logics, and operations occurring on a table, rather than having the logics scattered in functions, scripts and libraries. This brought to the table a very convenient way of addressing logical changes which happens over time period. So going forward if any changes have to be addressed on a specific table we just have to traverse through the DAL of that table and check the existing logic and then build your logic on top of it or replace the existing logics. All said and done, debugging a DAL is pretty much easy as debugging any script, library or any other functions. I am not sure if you have encountered a problem where in you put the DAL in debug mode using the following approach. 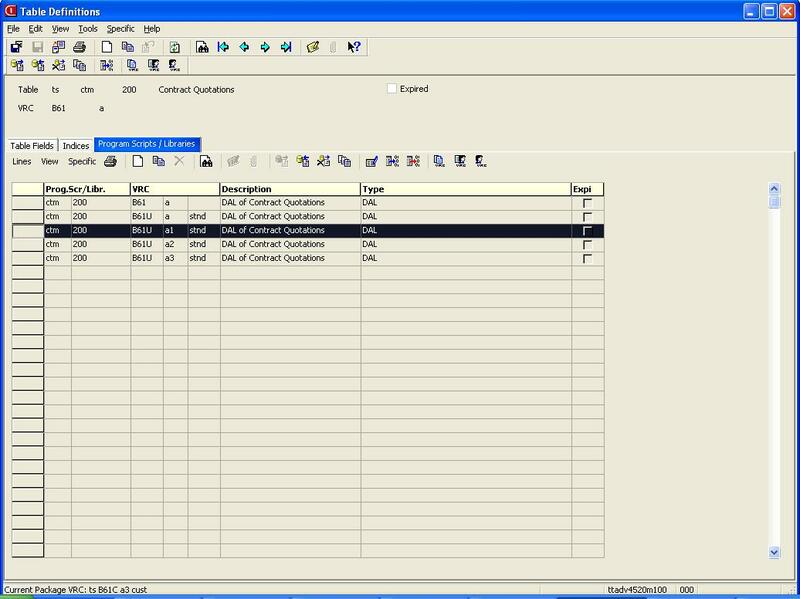 Select the table for which the DAL has to be debugged using session table definition, ttadv4520m000. Double click on the selected table, the following session will open. Here select the appropriate VRC and then click on debugger icon. Select the appropriate VRC and Right click and select the Compile with Options -> Debugger. This will put the DAL object in debugger mode. 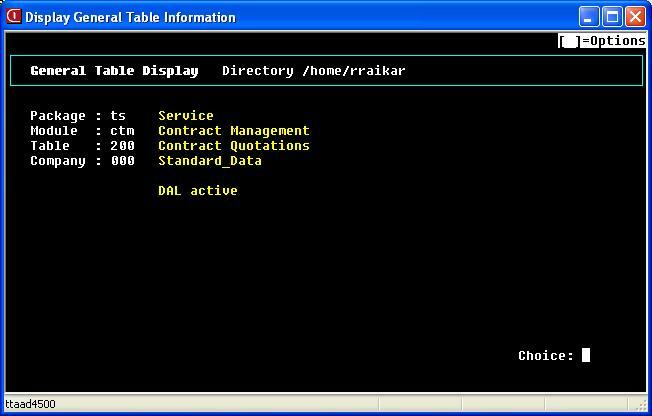 Now to test whether DAL is in debugger mode, Open General Table Display (ttaad4500), find the table in GTD and ensure DAL is active and in choice input ‘Y’(if user language is English). If DAL object is in debug mode, then when you input ‘Y’ in the choice field, a debugger screen will open. In few cases the debugger screen might not open, the reason behind this would be the DAL object might not have gone in to debug mode, when you carried out the above steps. The Solution to this, when you are compiling the DAL script in debugger mode, ensure that all instances of the table should be closed i.e. We need to ensure any instances of the above probabilities are closed on the server where you are planning to put the object in debugger mode. In case of UNIX OS, you can use grep the processes which are being run on the server to ensure that no other person is accessing any software components related to the DAL table under considerations are closed. Once all instances are closed, you can then go and debug the object as specified in the step above. This will ensure the debug object is created and you can then use the debugging option in the debugger screen to debug the issue step by step or with breakpoints whichever appropriate. If you have faced similar issues and if there is any better method to trace the users using the components which has dependency on the table, then please use this medium to share across your experience. This will hugely benefit people in Baan World.